An RV is seen damaged after firefighters extinguished the blaze in the Cheviot Hills area on Monday, Nov. 20, 2017. CHEVIOT HILLS, LOS ANGELES (KABC) -- Arson investigators responded after a body was found inside an RV that caught fire in the Cheviot Hills area of Los Angeles. 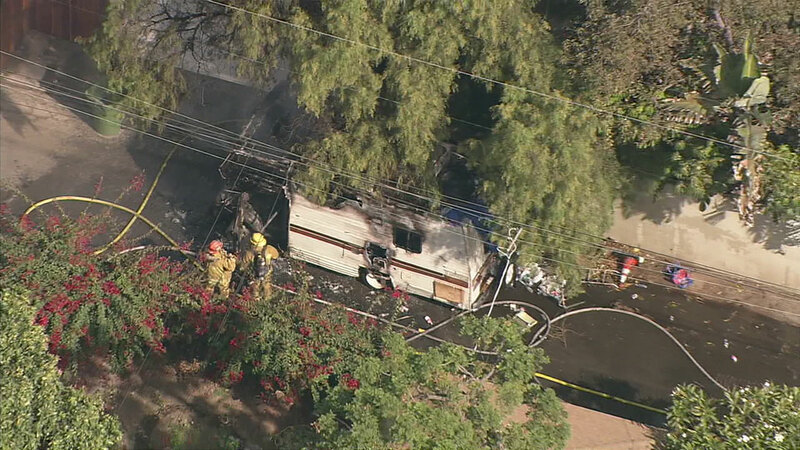 The RV fire was reported at about 11:15 a.m. in an alley in the 2700 block of S. Westwood Boulevard, Los Angeles Fire Department officials said. It was later confirmed a person was found dead inside the vehicle, and arson investigators were investigating the scene. Authorities said the victim was a 46-year-old man who lived in the RV with his wife and two dogs. The couple returned to find the RV on fire, so the man re-entered the RV to try to rescue his dogs.